A tart, tangy, lightly sweet nibble, delicious with a cup of tea. Makes an unusual holiday food gift. This recipe is from my favorite guest cook. I'm just the photographer and note-taker here (and quality control manager--someone has to taste test!). The recipe is simple: grapefruit peels, sugar, honey or syrup, and water--but there is technique involved, so I've opted to use more photos and fewer words. However if you like to read, don't despair! 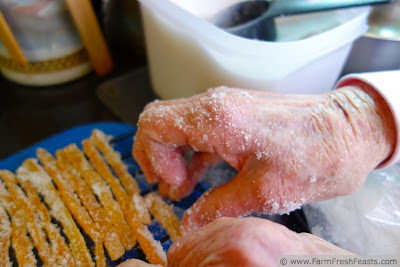 For my 30 Days to Better Food Photography Challenge one of our early tasks was to 'write your food photo story' and I took the assignment a wee bit too literally, so after the recipe I'm sharing my short story, Grandma Came for Tea. First, the recipe. Scrub grapefruit under running water. 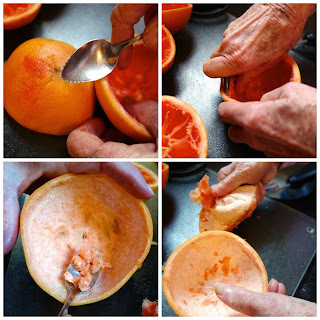 Scrape off the pith as shown below (a grapefruit spoon works well for this). Place in a saucepan, cover with water, bring to a boil, and drain. Repeat the boiling/draining step. 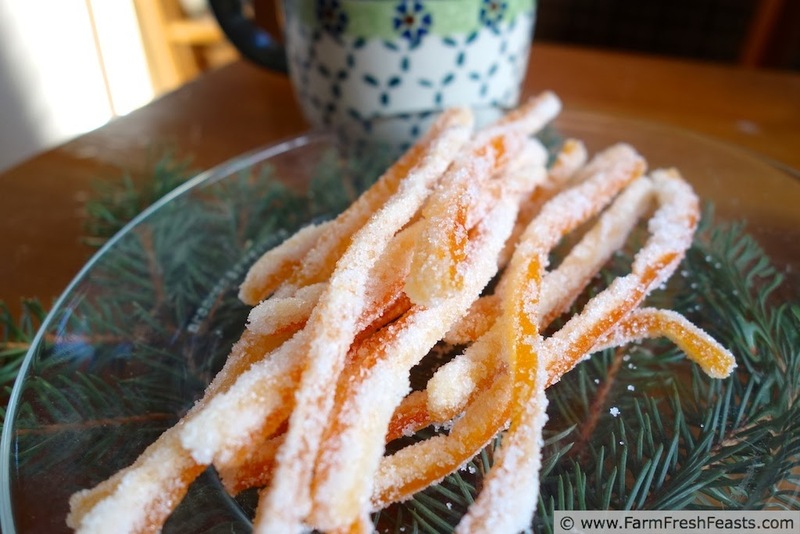 Place in a large heavy bottomed pot (Amazon affiliate link) with ¾ cup sugar and honey. Cook slowly over low heat for 20 minutes or until the peel is softened and the liquid is nearly cooked off. Place ¼ sugar into a bag, add about 4 strips of peel at a time, and shake until coated. Stretch out on a rack to dry. Repeat, adding more sugar as necessary. Let dry 12 hours, until firm, then transfer to a container for longer storage. Keeps 1 month at room temperature or up to a year in the freezer. 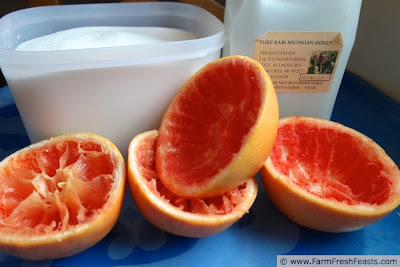 Save the extra grapefruit sugar to sprinkle on muffins, pancakes, or probably a cookie would go nicely under it as well. This is a messy endeavor--but fun! 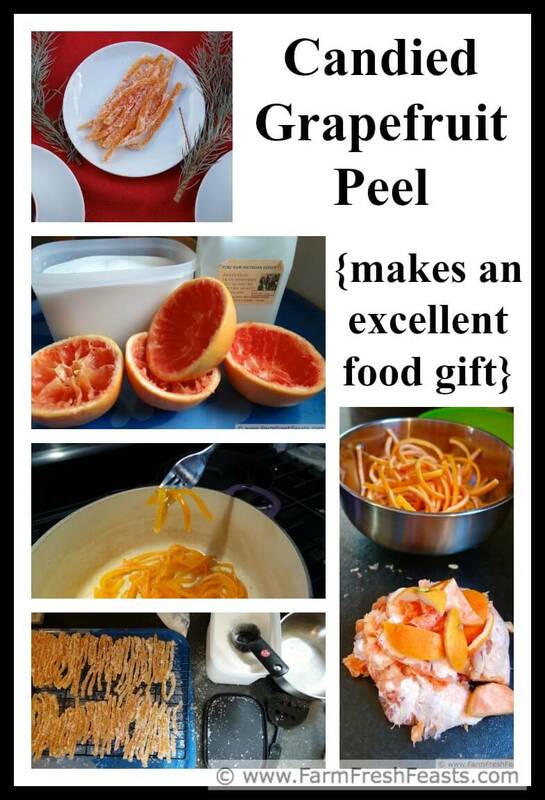 If you've got grapefruit--try this at home. It's an acquired taste--not for everyone, but those who love it (like my Grandma) just love it. Now grab a cup of something good and enjoy my extra credit assignment. My grandma emigrated from Scotland when she was 17 yrs old, and for the rest of her life she observed the ritual of afternoon tea. In the 1960s, in the midwestern US, women got things done during morning "coffees". My mom was active in many women's groups, and she'd drag my 3 yr old brother along. At one coffee, shortly before Grandma was to arrive for a visit, the hostess served candied grapefruit peel. My mom thought it would be excellent for afternoon tea, got the recipe, and stopped by the grocery store to pick up 3 grapefruits on the way home. My brother ate those 3 grapefruits for lunch. 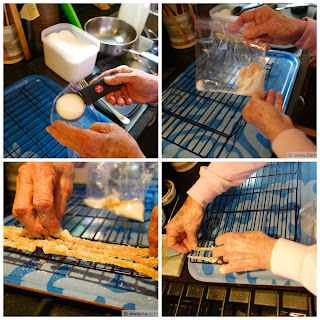 By the time Grandma arrived, mom had made her first batch of candied grapefruit peel and they enjoyed it with their afternoon tea. My husband just showed me a recipe for candied grapefruit peel yesterday. Now yours. 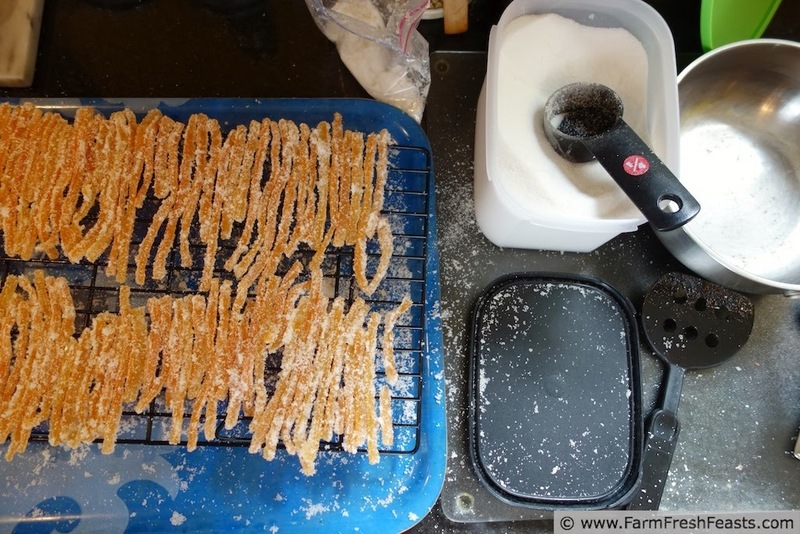 I think the kitchen gods are telling me to make some candied grapefruit peel! The pictures make the process look manageable. Thanks for taking the time to do them! And I love the story about your grandmother and mother. Beautiful! Sometimes, ya gotta listen to the kitchen gods! I used to take or leave tea, but especially in cooler weather there is just something about a nice cup of tea--be it the first sip in the morning, or sitting down to a cup and a little nibble in the afternoon. They look so beautiful! Like jewelry. 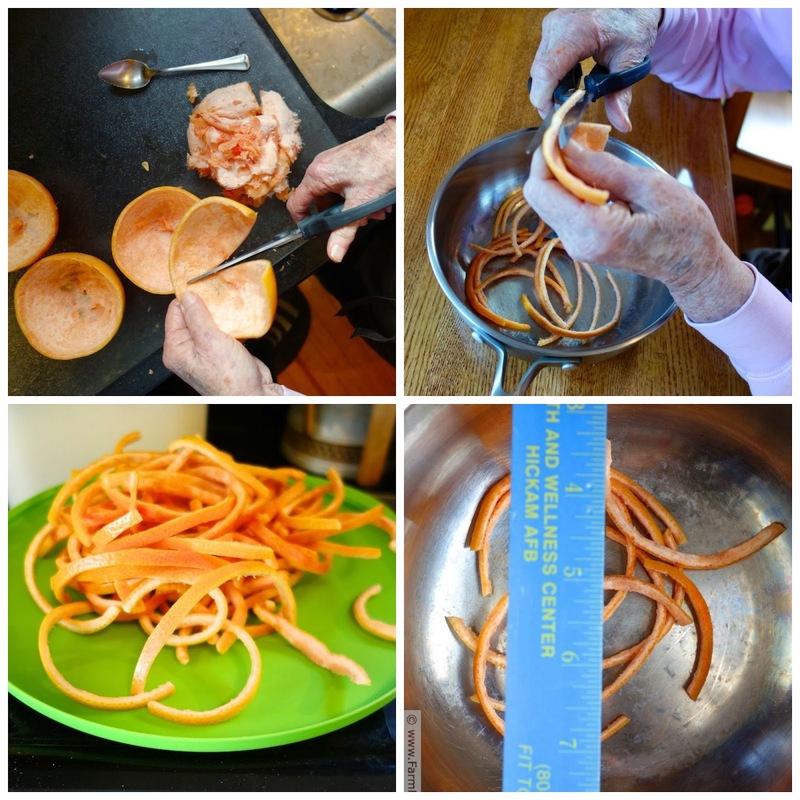 My mom thinks she's from the wrong era, as no one previously described her grapefruit peel as jewelry! So pretty and yummy - these would make a wonderful holiday gift! We included them in our treat trees for the neighbors--a few cookies, some muffins, salted caramel pear & apple butter, and candied grapefruit peel. Hopefully something for everyone! I enjoyed the story and I also loved seeing your mom's hands throughout. There's something beautiful about them and the idea of one generation teaching the next. 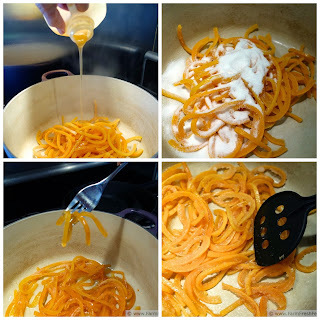 Candies grapefruit doesn't sound bad either and messy recipes are sometimes the best ones. Let's just make sure that my mom knows I didn't solicit this comment--and I'm not the only one who loves her hands! We're doing this tomorrow for homemade Panetonne - thanks for the great tutorial! We shared with our FB followers at homesteadlady.com. Homemade Panetonne--what a spectacular undertaking. I hope it turned out well for you! These would make incredible and AMAZING garnishes for my cocktails I'm making tonight!! LOVE them Kirsten! PS. I know I've been rather absent lately. I'm working on changing that now. I miss you and your fabulous posts. I hope this New Years brings you plenty of joy and laughter and love and happy food. You're amazing - I'm so lucky to know you!! xoxoxoxo! P.P.S. I'm going to opt to use more photos and fewer words on the blog this year. That's a plan. I think we rely too much on words sometimes. Also, more details on this photo challenge!! I wanna play! I was thinking about you and cocktails when I was writing up my Grapefruit Honey Bran Muffins the other day (I dipped the tops--ok, technically my daughter did--in the leftover grapefruit sugar, but it would be excellent to coat the rim of a cocktail glass). The challenge--click on the link to get to Neel's website where you can follow along each day's assignment. I'll share on FB whenever I learn when he's going to run it again. 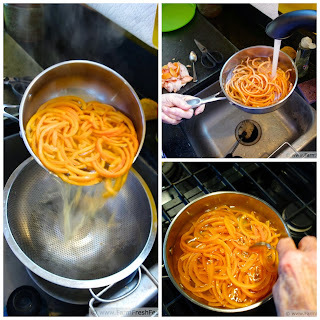 I usually make this and kids loved it.